As a designer, I love the process of bringing our thoughts to life is wonderful and full of excitement. 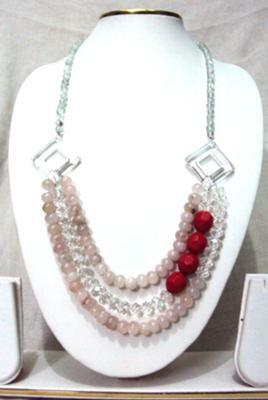 Light pink gemstone beads and Synthetic watermelon Beads highlighting the bold and energetic Red Color with Pearl Luster Plated Glass Crystals. Acrylic Squares, Pearl Luster Plated Glass Crystals, Assorted Gemstone Beads.